Questions should be directed to press@creativecommons.org. Creative Commons is happy to announce the launch of CC Belarus. Youth organization Falanster is now the belarusian Creative Commons affiliate team! Falanster began using Creative Commons licenses on its own sites (falanster.by, pirates.by, drupal-sliot.by), has been hosting meetings to endorse the open source principles, organised the Minsk Open Data Day in 2014, and has hosted several summer courses with lectures and panel discussions about copyright law and necessary reforms. Since 2013, Falanster has been holding Wiki-Days periodically, encouraging participants to add articles and photos to Wikipedia (Belarusian, Russian, English). The team has also been spreading information about Creative Commons through leaflets. After months of discussions, deliberations, and planning between CC staff, African Regional Coordinators, African Affiliate teams, and others in the open space, Creative Commons Africa is set to storm Africa by having a continent-wide launch for School of Open in September. School of Open is a global community of volunteers providing free online courses, face-to-face workshops, and innovative training programs on the meaning, application, and impact of “openness” in the digital age. Through School of Open, you can learn how to add a Creative Commons license to your work, find free resources for classroom use, open up your research, remix a music video, and more! School of Open programs will be launched in Kenya, Tanzania, Nigeria, and South Africa in September on a series of topics ranging from Creative Commons licensing, intellectual property protection, open society concepts, and the Linux operating system . Strategic collaborations are underway with the Mozilla Foundation, Nigerian Institute of Advanced Legal Studies, WikiAfrica, University of Lagos, University of Tanzania, and the Institute of Educational Management Technology of the Open University of Tanzania to make the launch a success. School of Open Kenya already started out as a trail blazer by organizing a two-week after school program that introduces high school students to open culture through the use of online School of Open courses and related open educational resources (OER). The training was designed to satisfy the academic needs of the students and to enable the students to use open tools such as Creative Commons licenses to create and share knowledge, as well as learning required subjects in new and creative ways. The students integrated the School of Open training into their school work and were able to produce projects such as this Titration Demo video by the Lenana School under CC BY. Despite its long strides, Jamlab and CC Kenya are not resting their oars; they will be launching a Train the Trainers program this September where they will train 10+ community members to organize and run SOO workshops in more high schools and in neighboring countries. SOO Kenya will also host a SOO Africa launch event and Maker Party entitled PopJam. Jamlab + CC Kenya, in collaboration with Mozilla Kenya and Wikipedia Kenya, will host the event for 5 high schools in the region. Stay tuned for details! CC South Africa hosts three projects under the School of Open initiative. The first is the #OpenAfrica project where in conjunction with WikiAfrica, open advocates from Cote d’Ivoire, Ethiopia, Malawi, Uganda and Ghana were put through an “open” bootcamp. The month-long camp covered Creative Commons, Wikipedia, Open Street Maps, Open Educational Resources (OER), Open Data, Open Government, and related fundraising and community building skills. Advocates returned equipped with “open” knowledge and skills to their home countries to influence and spur their communities into action. This has resulted in the creation of new CC affiliate teams in Ethiopia and Cote d’Ivoire and the launch of open mandated tech hubs in these communities. Launching off #OpenAfrica, participants were invited to compete for the first Kumusha Bus stop. The Kumusha Bus is an African adaption of the South American Libre Bus. Ethiopia ‘won’ the first Kumusha Bus stop. The team spent four days inspiring, teaching and sharing at GIZ Headquarters in Addis Ababa. Participants from Sheger Media, AIESEC and Addis Ababa University were in attendance. The four days resulted in the launch of Project Luwi. Luwi is an open source project, aiming to increase the application of open source information and communication technologies (ICT). Luwi intends to create a local community of interested volunteers that is able to foster motivation and creativity around Open Educational Resources (OERs) and supports a culture of sharing information freely in Ethiopia. The third project is the Creative Commons for Kids program (CC4Kids). CC4Kids was built with Obami, a South Africa-based social learning platform. The course is self-taught and takes about 45 minutes to complete. 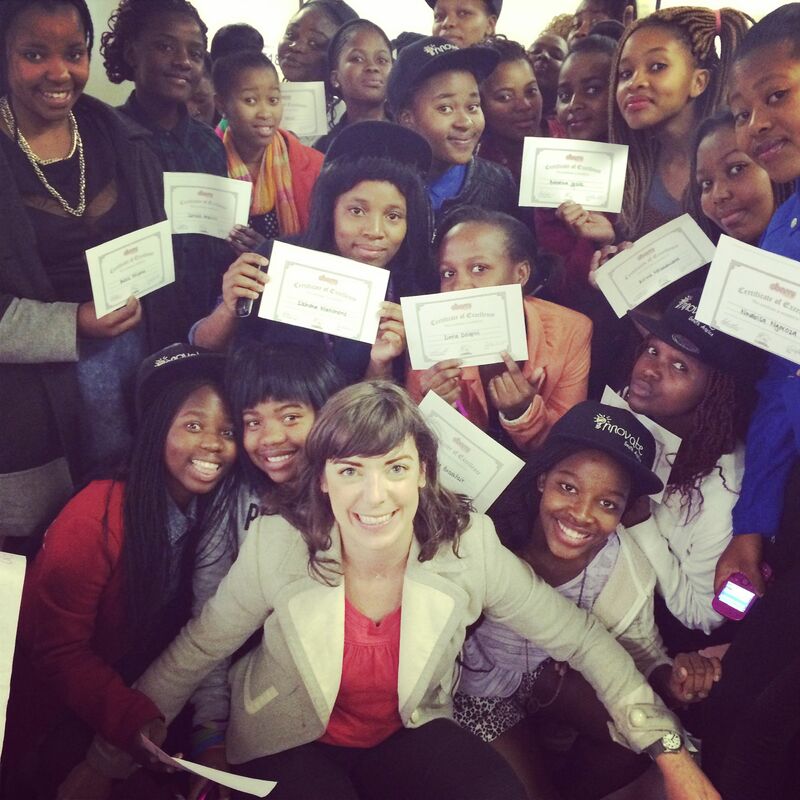 CC South Africa was invited to teach its first course as part of a Maker Party at the Code for Cape Town project (Code4CT) with 24 grade 10 and 11 girls from the Centre for Science and Technology (COSAT) in Cape Town, South Africa. For three weeks the girls were trained on how the web works and actively participated in building web content. Instead of policing students’ actions, CC4Kids teaches youth how to open and share their creative and educational works legally through the use of CC licenses. All the girls now have simple web pages they created. CC4Kids’ next Maker Party will be held at RLabs in August. Stay tuned! CC Tanzania is planning to host three sets of trainings. The first will be an ICT empowerment training for unemployed youth, the second will focus on teaching persons with disabilities how to use computers, and the third will focus on training educators on using ICT to improve how they teach their students. Participants will become new School of Open volunteers, improving and running future training programs as a way to give back to and grow their community. Development will be led by CC Tanzania volunteers with expertise in law, journalism, and information technology. CC Tanzania will host a joint SOO Africa launch event + Mozilla Maker Party, date and location TBD. CC Nigeria will, in five weekends, train participants on Nigerian copyright law, intellectual property protection, and the Linux operating system. The training will have two tracks: the first track being copyright law and the second being the Linux operating System. Participants will have the opportunity to choose either or both tracks. CC Nigeria also plans to host a joint SOO Africa launch event + Mozilla Maker Party during the training. During the event, experienced web users will train participants on easy ways to creating content using Mozilla tools. After the continent-wide launch, participants who attended the courses will have together obtained and built knowledge of open culture, IP protection and ICT skills. Stay tuned to this blog or sign up for School of Open Announcements to be notified when each program launches in September! Learn more about how you can get involved with the School of Open at http://schoolofopen.org. Yesterday Europeana published a great case study documenting the experiences of the Dutch Rijksmuseum in opening up access to their collection of digital public domain images. The case study was written by Joris Pekel, community coordinator for cultural heritage at the Europeana Foundation. Over the last few years, Europeana has worked with the Rijksmuseum in order to make available at the highest quality possible images of public domain artworks held by the museum. The report discusses the Rijksmuseum’s initial apprehension to sharing these high quality images of public domain works. The museum originally planned to share the digital reproductions of public domain works under an open license, such as the Creative Commons Attribution license (CC BY). But after some convincing by organizations that advocate for unrestricted access to the public domain, the Rijksmuseum began to open its collections more by choosing to use the CC0 Public Domain Dedication for the digital reproductions. The Rijksmuseum began to experiment with how it would offer high quality reproductions of the public domain artworks. The museum adopted a mission-driven approach, and staff understood the opportunity to showcase the best of the museum’s collection as a promotional tool. The marketing department argued that “…The core goal of the museum is to get the collection out and known to the public as much as possible…[and] the digital reproduction of an item would pique public interest in it, leading them to buy tickets to the museum to see the real deal.” The Rijksmuseum also realized that by releasing high quality digital reproductions of works out of copyright, it could help educate the public by providing true-color images and accurate metadata about the works. Instead of worrying that making available high quality digital reproductions of public domain artwork for free would destroy a piece of the museum’s revenue stream, the Rijksmuseum initially adopted a hybrid approach. They made images available in two sizes: .jpg images at approximately 4500×4500 pixels were free, while the huge 200MB master .tiff files were made available for €40. The museum saw a steady increase in revenue from image sales, but eventually decided to discontinue the tiered offerings. Since October 2013 the Rijksmuseum has been releasing their highest quality images for free. The Rijksmuseum has found a way to support broad access to its rich collection of cultural heritage resources. And it’s done so in such as way that promotes interest by new audiences, recuperates costs, and upholds the principles of supporting unrestricted access to the digital public domain. Take a look at the full case study. Why Open? What does open mean? Does it mean free? Does it mean without restriction? What is the role of the producer? What is the role of the consumer? Why is open important? How does open relate to you and your area of expertise? In this course, we will discuss and answer these questions. With your help, we will explore the different meanings of open in various contexts as well as its benefits and issues. Participants will use open practices to complete a series of open activities that builds into a final project. Facilitators include Christina Hendricks (Philosophy lecturer at the University of British Columbia), Simeon Oriko (School of Open Kenya Initiative), Jeanette Lee (English lit and writing teacher), and myself. Read more about the course over at the School of Open blog. Sign-up is open now through 10 August; to join, simply click the ‘Start Course’ button on the lower left of the course page. Fiction-writing community Wattpad has upgraded to the Creative Commons Version 4.0 licenses and unveiled several improvements to its CC implementation. As of today, there are 300,000 CC-licensed stories on Wattpad, making this one of the largest adoptions of Version 4.0 to date. Read the full press release and find more information in Wattpad’s announcement. Congratulations to Wattpad and its community of 30 million writers and readers! #Code4CT is a three-week training program from Innovate South Africa with twenty-four grade 10 and 11 girls from Centre for Science and Technology (COSAT) in Khayelitsha (Cape Town, South Africa). The three-week course consists of sessions on how the web works and actively participating in building web content. Running over the girls winter school break, they learn about the design process, HTML and CSS programming languages – skills they use to build WordPress sites for their clients. The girls then take their new skills and create mobile sites for local community organizations to benefit their communities. We were lucky enough to be invited with Obami (learning platform) to test out the School of Open CC4Kids program. The program was funded through a Creative Commons Affiliate Project Grant. We have run the course through a self-study platform but this was the first time running it in real life. We were inspired by how quickly the girls took to the course content. The course’s modules focus on basics of Copyright and CC licenses – by the end of the hour, the girls were creating their own CC licensed material! It was an inspiring day. A highlight of the day was the girls remixing the Pharrell Williams dance steps from “Happy” as a remix exercise Hack the Happy Dance. We are also attending their “pitch” sessions today to see what mobile apps they designed. This week, Creative Commons US lead and CC board member Michael Carroll addressed the US House of Representatives Subcommittee on Courts, Intellectual Property, and the Internet. In his address, he emphasized that the success of Creative Commons tools doesn’t eliminate the need for copyright reform; it underscores it. He also laid out the case for why Congress should not extend copyright terms again. Congress, copyrights have to expire. The constitution says so. Congress’ power to grant the exclusive right to authors in their writings is for a limited time. That limited time currently lasts for the life of the author plus 70 years. From an economic perspective, to promote the progress of science means to provide a sufficient incentive for both the creator and the investors in the creative process to make a fair return on that investment. Life plus 70 is far longer than necessary to achieve that goal. Professor Carroll asked Congress to consider a move to the way copyright law in the US functioned prior to the Copyright Act of 1976, which went into effect in 1978. The pre-1978 system offered creators an initial term of 28 years and an option to opt in to a second 28-year term. You can read Professor Carroll’s written testimony on the Creative Commons US blog. Correction: This post previously referred to the Copyright Act of 1976 as the Copyright Act of 1978. The Act passed in 1976 and went into effect on January 1, 1978. WikiProject Open is an online School of Open training program for new and seasoned Wikipedia volunteers to collaborate on improving Wikipedia articles related to openness. The aim of the project is two-fold: in addition to improving Wikipedia articles related to openness (such as open access publishing and open educational resources), volunteers seek to improve Wikimedia content generally with the aid of openly licensed materials. Visit the wiki page here. And read more about School of Open training programs here! It is well known that the rules that allow for certain educational uses of copyrighted works under certain conditions without permission of the rights’ owners vary greatly between countries. But how different are those rules? And how difficult is to access those differences? Can a teacher with no legal background determine alone whether a certain use is allowed or not in his/her country? We are answering these questions in a new working paper titled „Educational Resources Development: Mapping Copyright Exceptions and Limitations in Europe”, prepared by Teresa Nobre (Legal Lead of Creative Commons Portugal). The study is an investigation of the fragmented European landscape of copyright exceptions and limitations for educational purposes, across 49 European states. We intend to understand the obstacles faced by teachers in each of the countries analyzed The shape of L&Es translates into limits to the free usage of content in education – and the more complicated the rules are, the more difficult they are for educators to follow. The Open Educational Resources model has been traditionally seen as avoiding altogether the standard copyright regulations, by relying on a voluntary, free licensing model that establishes broad user rights for educators. The fragmentation of L&Es further proves the importance of open licenses for the development and dissemination of educational resources. Yet it is impossible for educators and learners to rely just on OERs. As Creative Commons already stated, no matter how well crafted a public licensing model is, it can never fully achieve what a full set of open-ended and flexible statutory exceptions and limitations for educational purposes can. Only with a legal reform in place can we see an end to this balkanization of legal solutions and treat education as it deserves to be treated – as an exception to copyright and related rights. We hope that the results of the study will provide evidence, within the current debate on copyright reform in Europe, for the need to further harmonize and strengthen user rights in education. CC is supporting the Bouchout Declration for Open Biodiversity Knowledge Management by becoming a signatory. The Declaration’s objective is to help make biodiversity data openly available to everyone around the world. It offers the biodiversity community a way to demonstrate their commitment to open science, one of the fundamental components of CC’s vision for an open and participatory internet. Many of the attendees of the workshop and of the report cited above are among those who met in June in Meise, Belgium and released the Bouchout Declaration. The declaration calls for free and open use of digital resources about biodiversity and associated access services and exhorts the use of licenses or waivers that grant or allow all users a free, irrevocable, world-wide, right to copy, use, distribute, transmit and display the work publicly as well as to build on the work and to make derivative works, subject to proper attribution consistent with community practices, while recognizing that providers may develop commercial products with more restrictive licensing. This is not only aligned with the vision of CC itself, CC is also the creator and steward of the legal and technical infrastructure that allows open licensing of content. 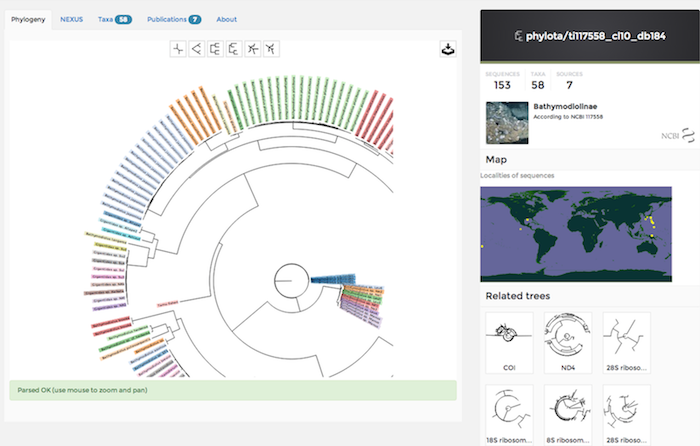 Screenshot of phylogeny from PhyLoTA as displayed in BioNames. The user can zoom in and out and pan, as well as change the layout of the tree from BioNames: linking taxonomy, texts, and trees by Roderick D. M. Page used under a CC BY License. The declaration also promotes Tracking the use of identifiers in links and citations to ensure that sources and suppliers of data are assigned credit for their contributions and Persistent identifiers for data objects and physical objects such as specimens, images and taxonomic treatments with standard mechanisms to take users directly to content and data. CC has participated from the beginning in the activities that led to the Joint Declaration of the Data Citation Principles and that promotes the use of persistent identifiers to allow discovery and attribution of resources. Finally, the declaration calls for Policy developments that will foster free and open access to biodiversity data. CC works assiduously on creating, fostering, nurturing and assisting in the promulgation of open policies and practices that advance the public good by supporting open policy advocates, organizations and policy makers. We have a few concerns: most copyright laws around the world treat data as not protected by copyright, thus would not require licensing. We are also aware that some cultures wish to preserve and protect traditional knowledge, so we want to make sure information is released by only those who have the right to do so without impinging on the rights of such segments that might otherwise be negatively affected by its release. However, overall we believe that open biodiversity information is crucial for science and society. Be it heralding the Seeds of Change, participating in the Group on Earth Observations (GEO), or assisting the Paleobiology Database to move to CC BY license, CC is playing a vital role in the progress of open science in the areas of biodiversity and natural resources. CC has committed to assisting organizations joining Google in the White House Climate Data Initiative. On a personal front I have released the entire codebase of Earth-Base under the CC0 Public Domain Dedication making possible applications such as Mancos on the iOS App Store. Most of the world’s biodiversity is in developing countries, and ironically, most of biodiversity information and collections are in developed countries. Agosti calls this, “Biopiracy: taking biodiversity material from the developing world for profit, without sharing benefit or providing the people who live there with access to this crucial information.” (Agosti, D. 2006. 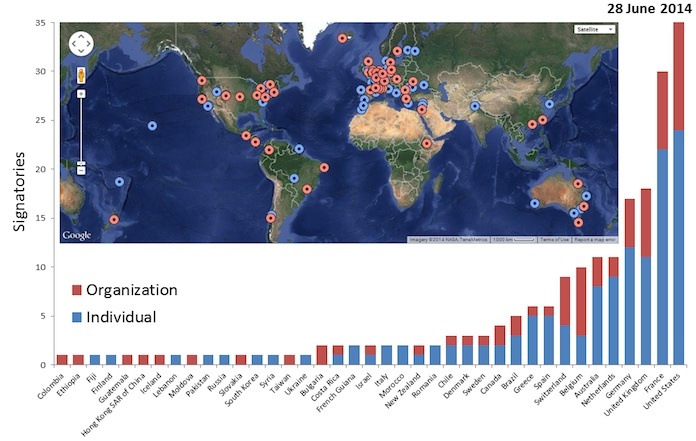 Biodiversity data are out of local taxonomists’ reach. Nature 439, 392) Opening up the data will benefit the developing counties by giving them free and easy access to information about their own biological riches. Friction-free access to and reuse of data, software and APIs is essential to answering pressing questions about biodiversity and furthering the move to better understanding and stewarding our planet and its resources. Signing the Bouchout Declaration strengthens this movement. CC is very proud to announce three additions to its Asia-Pacific community – two new affiliate teams in Mongolia and the People’s Republic of Bangladesh, and a revitalised team in the Republic of India. This boosts our Asia-Pacific community to 16 members and adds a great deal of valuable expertise to our affiliate network. The first of these new groups to join us was CC India, which had its re-launch in November 2013. CC has had affiliate representation in India previously; however, the new team represents a substantial expansion of our Indian community following many years of networking and outreach by key people locally and internationally. It brings together three groups each of whom are already lead advocates for open culture and its benefits in India – the Centre for Internet and Society, based in Bangalore, will be be providing legal expertise; Acharya Narendra Dev College, who will take the lead in Open Education Resources; and Wikimedia India, who will focus on social outreach and community development. Each group contributes its own lead to help manage the governance of the team – Dr. Savithri Singh (Public Lead, Acharya Narendra Dev College), Sowmyan Tirumurti (Public Lead, Wikimedia India), Pranav Curumsey (Public Lead, Wikimedia India), Pranesh Prakash (Legal Lead, The Centre for Internet & Society). This new team has achieved a great deal over the past year, including workshops, translations and a collaborative competition for their own logo. The next to arrive on the scene was CC Mongolia. Based out of the New Policy Institute’s DREAM IT and the Open Network for Education, ONE Mongolia, this team began to self-organise through a series of seminars designed to spur open culture in Mongolia, including a workshop lead by CC’s then Regional Coordinator for the Asia-Pacific, Chiaki Hayashi. Spurred by the energy from these events, as well as the success of the 2012 UNESCO OER Declaration, a team formalised late last year with leads drawn from across several organisations: Mr.Z.Batbold (Executive Director, New Policy Institute), Dr.D.Enkhbat (Public Lead), Ms.D.Nergui (Legal Lead), Ms.Baasansuren Burmaa (Technology Lead), and Dr. N.Norjhorloo (Community building in civil society). Following on from the founding workshops, they have begun their first project releasing open material through ONE Academy. Last but not least, the very newest members of the CC family are CC Bangladesh. Once again, this team grew out of an enthusiastic group of people who were already working to encourage the adoption of open principles in Bangladesh, in this case the Bangladesh Open Source Network (BdOSN), which has been operating locally since 2005. The team will be led by Nasir Khan Saikat (Public Lead) and Munir Hasan (Lead, (BdOSN). Their goal is to create a broad organization where the open source and open content communities can exchange ideas and embark on new initiatives designed to raise awareness and encourage people to share information and resources. Both CC Mongolia and CC Bangladesh plan to hold formal launch events later this year. We welcome these new members of our community, and will seek to assist them in any way we can to achieve their goals. We look forward to great things from these already very active and experienced teams. Welcome to the family! Today, Creative Commons and over 35 other organizations published an open letter urging negotiators of the Trans-Pacific Partnership (TPP) to rescind a proposal to extend copyright terms by another 20 years beyond its current, mandatory term. This week, 12 Pacific rim countries are meeting in Ottawa, Canada, to continue secret negotiations of the widely criticized TPP trade agreement. Under the current TRIPS agreement, signatories are required to enact legislation granting copyright protection to individuals for the life of the author plus another 50 years. TPP negotiators, under the influence of large rights-holding companies, want to add another 20 years to the minimum copyright term. If adopted, this extension would work to keep creative works out of the public domain for decades beyond the current term. It’s essentially a double-life sentence for all new works. This would be an incredible loss for the commons. All creativity and knowledge owes something to what came before it – every creator builds on the ideas of their predecessors. Copyright is a limited right that is given to creators, but it also has a term limit to ensure we all benefit from culture and knowledge. Both the rights granted to creators and rights afforded to the public are necessary for a vibrant culture and the proliferation of knowledge. And the “Commons” in Creative Commons starts with the public domain. It’s the original corpus for remix. It’s why we’ve developed tools to better mark and dedicate content to the public domain. Together with hundreds of millions of works whose creators have chosen to share under generous terms of reuse with CC licenses, the commons is growing richer everyday. Extending the term of copyright will undermine the potential of the public commons and needlessly limit the potential for new creativity. There is no logical reason to increase the term of copyright – an extension would create a tiny private benefit at a great cost to all of us. Most people agree that the existing term already lasts far past the amount of time required to incentivize creation (the original purpose of copyright) by granting creators a limited monopoly over a creative work. Copyright should strike a balance, giving an incentive to create while also giving the public permission to use and build on that creativity. In 2002, CC co-founder Lawrence Lessig argued against an additional 20 years of copyright protection in Eldred v. Ashcroft. Even Milton Friedman opposed the copyright term extension, calling it a “no-brainer.” Nearly all contemporary economists agree. Increasing the term of copyright protection harms the commons. Any public policy that will further delay their entry into the public domain is contrary to the values we support – realizing the full potential of the Internet through universal access to the creativity that promotes active participation in culture and society. Participating countries should should reject any measure in the Trans-Pacific Partnership introduced to increase the term of copyright protection. And TPP negotiations should be held in public and with the input of a broad set of stakeholders that include civil society and public interest representatives. Although the letter has been presented to TPP negotiators today, they will remain open for further signatories to express their support. Interested organizations can endorse the letter here. Everyone can speak out by signing the petition at ourfairdeal.org. As part of the Open Knowledge Festival, taking place next week in Berlin, we are organizing a session on OER policies. If you’re in Berlin for the festival and have an interest in open policies – please join us! The session is titled Open Educational Resources and Policy: Overview and Synergies with Fellow Open Movements. The goal of the session is to present policies in support of open education. While policies have been an important matter during Open Knowledge Festivals in the past, educational issues have until recently not been at the heart of the Open Knowledge movement. This has changed last year with the founding of the Open Education Working Group – nevertheless, we hope to demonstrate the significance of OER policies and also demonstrate synergies with policies for open data or open access and more broadly open science. I am happy that I will be joined at the session by a great team of open educational policy experts, including Nicole Allen from SPARC, Delia Browne from the Australian Schools’ National Copyright Unit, Melissa Hagemann from Open Society Foundations and Tim Vollmer from Creative Commons. If you’re interested in OER policies, or are doing policy work in other fields and are interested in talking about synergies, please join us on Wednesday, July 15th at noon. The open education theme will continue at 14.00 with the Open Education Smörgåsbord. The session is co-organized by members of the OKFN Open Education Working Group, led by Marieke Guy. The session is meant as an opportunity to do some hands-on work around open education issues. At one of the five tables, we will be „Making OER policy crystal clear” – in a quick sprint, we’ll make an infographic explaining what OER policies are about. Other tables will work on best practices kits for teachers, open data for education, Q&A section for the Open Education Handbook and open courseware tools. You can read more about the session here and here. And since we’d like to have a real Smörgåsbord – please consider bringing some snacks with you (at best traditional / local ones from your country). The session will take place on Wednesday, July 15th at 14.00. Why the 4.0 CC licenses were a truly global effort. The astounding community-building work that CC affiliates are doing all over the world. Our work in open policy and support for global copyright reform. How software developers are using CC licenses to make sharing on the internet easier. The cool things you’re doing with CC licenses. The report features illustrations by the awesome webcartoonist Luke Surl. CC0 now has an official translation into French. This is the second translation of CC0, and also only the second official translation of any CC legal tool (following CC0 in Dutch, published earlier this year). There are many people who deserve congratulations on this accomplishment. This is often the case for translation projects, but it is especially true with French! According to the translation policy for our legal tools, we will be publishing only one official translation per language—for all of its speakers worldwide. This isn’t so difficult for some languages, which are primarily spoken in only one country. But with French-speaking countries around the world, many teams had to take part in this project so that the final text works for everyone, even across regional variations in language. CC France did the tremendous task of leading the effort, coordinating their own team as well as others from Algeria, Belgium, Cameroon, Canada, Luxembourg, Morocco, Senegal, Switzerland, Tunisia, and collaborators from Framasoft.org and VeniVidiLibre.org. The CC0 translations, as well as the upcoming translations of 4.0, are as close as possible to the original English, keeping the same legal meaning. Under our new translation policy, these will all be considered equivalent: anyone linking to the legal code may use any language. We think everyone should be able to understand the legal tools they’re using, and toward that end, we put a lot of thought into simplifying the language in 4.0. But it should be true in a language everyone can read–and thanks to the translation efforts of our affiliates, we are coming closer to this goal. There are many more translation projects of CC0 and of 4.0 in progress; expect to see more announcements in the coming months! (You can take a look at the list of projects in progress.) To get involved with an existing translation project or begin a new one, please see the translation policy for information on getting started. One year ago, CC announced the Affiliate Project Grants to support and expand CC’s global network of dedicated experts. With a little help from Google, we were able to increase the capacity of CC’s Affiliates to undertake projects around the world benefiting a more free, open, and innovative internet. We received over 70 applicants, and we were able to fund 18 to tackle important work in their country – work like using music to break down physical barriers and give Palestinians a voice, gathering leaders in Tanzania to discuss how sharing information can help prevent diabetes, and helping Romanian librarians provide quality educational materials to all. Watching these projects unfold over the last several months has been reaffirming for everyone at CC. The Affiliates are central to CC’s work, without whom we would simply not be closer to our goal of a more open internet. Click here to find out the full details of the different grants, and read on to see what our 18 teams had to say on the results they achieved, motivations for their projects, the work still to be done, and lessons learned. Congrats to the Affiliate teams for all the great work accomplished! “We are pleased that we were able to impact the way the people who shared their stories with us think about the concept of sharing stories. Some people when they were asked before to share their suffering and their personal stories on video were not totally sure they wanted to do it, but after seeing the output of their stories reflected on by poets and artists from all over the world, we think we were able to provide them a platform to express themselves and feel part of a greater community that is sharing the same hopes and fears. “Museums and other memory institutions in Taiwan often have their collections digitized. A major part of the digitized works shall be in the public domain. However, many of these institutions often keep these works in the equivalents of digital safes, and there are no easy ways to access and reuse them. Together with Netivism Ltd. (a social enterprise based in Taipei) CC Taiwan engaged with memory institutions and independent collectors in Taiwan about the tools and practices for public domain repositories. Today, we’re opening up a new job posting, for a director of development. This person will be in charge of raising money to support our work – building and maintaining our relationships with foundations, corporations, and individual donors. Creative Commons is seeking a Director of Development to lead development on behalf of the organization. You will be responsible for securing the resources and relationships necessary to fulfill our vision to realize the full potential of the Internet – universal access to research and education, full participation in culture – to drive a new era of development, growth, and productivity. Our reach is global and our ambitions are far-reaching — you’re going to have your work cut out for you. If you have a great track record as a fundraiser; you want to help strengthen the free culture movement; and you want to work in a fast-paced, international organization; then we should talk. To apply, please follow the instructions in the job listing. This guest blog post was written by Katelyn Rogers. It was originally published on the Open Knowledge Festival website. The Open Knowledge Festival team is thrilled to announce that Beatriz Busaniche will be joining us as a keynote speaker in Berlin this year. Beatriz Busaniche is a free software and culture expert and advocate, a board member of the Vía Libre Foundation in Argentina, a professor at the University of Buenos Aires, a core team member at Creative Commons Argentina, and a founding member of Wikimedia Argentina. Beatriz Busaniche’s “Freedom has Never Been Cheap – A Call to Action for Freedom and the Public Domain” will draw on the wealth of experience she has in fighting to keep the internet open and free. This talk will do more than simply explain how the public domain is at risk; Beatriz will call on all OKFestival participants to lead the way for the entire global open knowledge community. Because ‘free’ as in ‘freedom’ has never come cheap, she will ask that we go beyond passive learning by joining forces and putting ourselves on the front line in the fight for a free public domain. To help us take those first steps, Beatriz will offer examples of and learnings from her own experiences as an activist fighting for the freedom of the public domain and, in doing so, her keynote will aim to truly address and impact the challenges which we are currently facing in the intellectual property debate. Here is a sneak peak (in Spanish) of Beatriz speaking at TEDxCordoba, and as you may be able to see, we have a lot to look forward to! Beatriz Busaniche’s Keynote will be followed by a Q&A session moderated by Creative Commons board member and Web We Want lead Renata Avila. We will open up the discussion to questions from the audience as we begin to develop long term strategies for engaging the entire open knowledge movement in the defence of the public domain! There are still tickets left. Join Beatriz Busaniche and hundreds of other members of the global open knowledge community at OKFestival from July 15th to July 17th to share experiences, learn from peers, and collectively build a stronger open knowledge movement. Don’t miss out, buy your OKFestival tickets today.